Welcome to the land of Elden! In this land you will find many creatures and people of different shapes and sizes, however above all of this you will find a lot of drama. In this mountainous realm inhabited by strange men and creatures your character will find a world to explore along with other characters to meet. However, please inform human resources (me) via PM about your character before venturing into this land. 1. Make sure to use "" when your character is talking, ** when they are performing an action, and italicize your words when your character is thinking to themselves. 2. Make sure to also post in parenthesis when posting out of your character as well. 3. Please notify me when you create your home and the location of your home so it can be added to the map. 4. Do not kill other characters unless it is planned out in advance with that character's owner. 5. You can have up to one character in this RP. 6. Sexual tension is allowed but do not let it get out of control. 7. You cannot build a home in a hostile area. Large creatures that once inhabited the great land of Elden. The dragons, once led by a large cyclops dragon; Darrus, were driven from the land by the deceased King Ascius II. Ever since the death of Darrus the dragons were driven from the lands and sent to the heart of the rugged mountains. Legend tells however, that one day another cyclops dragon will be born to lead the dragons into Elden; to reclaim their lands. Large stone humanoids that dwell within the Land of the Giants. They're origination to the people of Elden is still a mystery but rumor tells that they are directly linked to the extinct race, the cyclops dragons and the evergrowing presence of the Lords. The real question is though, what kind of link that is. Scaled wraths from another plain of existence. Once a insignificant threat to the land of Elden, the Lords of grown considerably in size to the point where they have now amassed a large army that continues to grow. What they're intentions are on the land of Elden are not known, but some have speculated that they may be the bringers of the apocalypse itself; of course, that's just speculation. Hey how can I fight enemies on the map? Good question! The way you fight enemies on the map is the same way you RP. Essentially all you have to do is use ** in order to perform an action towards an enemy. One thing you will have to do while fighting these enemies though, is put their actions and words into a red text when you are fighting with them. What do enemies look like? One thing I always encourage is creativity, so I let the roleplayer design the enemies that they fight. However, make sure that the enemies don't stray from the original design of a creature etc. a dragon. The same goes for how they fight you too! Just make sure that the strength of the enemy that you're fighting is reasonable, so no apocalyptic dragons! What about the cyclops dragons from the lore? At the current moment, this idea is being expanded upon. However, the idea behind a creature like this is that I may make an RP event in which everyone can participate in killing something that is based on lore. Have a question that you need answered? Just PM me and I'll do my best to answer you question and if I feel if it's important for everyone to see I'll put it on the OP. There has been too long time since I saw another person... I am beginning to get lonely. "I better sleep for a few hours..."
Great I thought it would be easy to get through the Fields but I guess I was dead wrong. I don't like flying today. I should make camp here. ....Heaven.....I hate you but I miss you...was what I did right? Think, Kass. You have two choices. Find someone to speak to or force yourself to sleep. ....Huh? Oh what woke me.....*Looks at Kass*....Holy! *gets up and points the spear at Kass* Lousy robber and a gargoyle too! My lucky day. Any last words? Huh?....He...hey!. *Follows Kass* What are you doing? Aren't you going to fight me? "I could if you want..."
"Please... Go easy on me"
*Lowers guard* Easy? Why? I want to fight a challenge so be that challenge! Man what is with this thing? Almost like....Nah I just want to fight. Now if everything is done lets fight! Hmhp! *dodges left and thrust the spear in Kass' direction* Have to do better then that gargoyle! You fly? *Block my right side with the spear* Course they do idiot! Well then I guess I can use my wings then. Why... Doesn't just don't she fly? 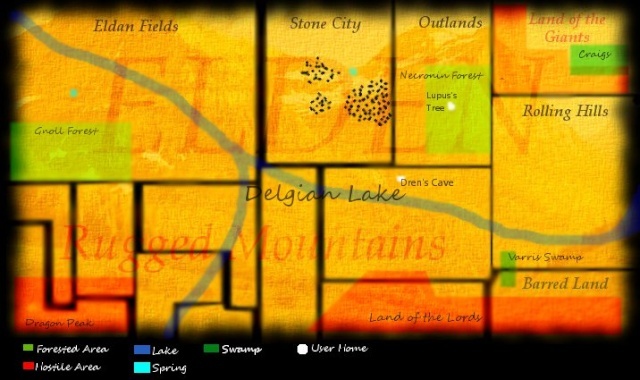 *revanant looks at the map for awhile then looks at Lupus* "Ok so it looks like we are in the fields rather than the city. We need to go right until we hit a road.